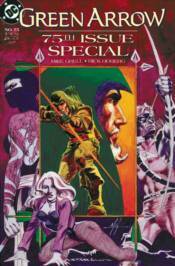 In these stories from GREEN ARROW #73-80, a mysterious archer from Oliver's past has come for his head. With the return of Shado, and the aid of Dinah Lance and Marianne, they will have to scour the Seattle Underground to uncover the truth. And GREEN ARROW: THE WONDER YEARS #1-4 revisits the earliest days of the Emerald Archer's crime-fighting career!